This is a dish worthy of a very special occasion, and that includes celebrating the end of a long, hard week! 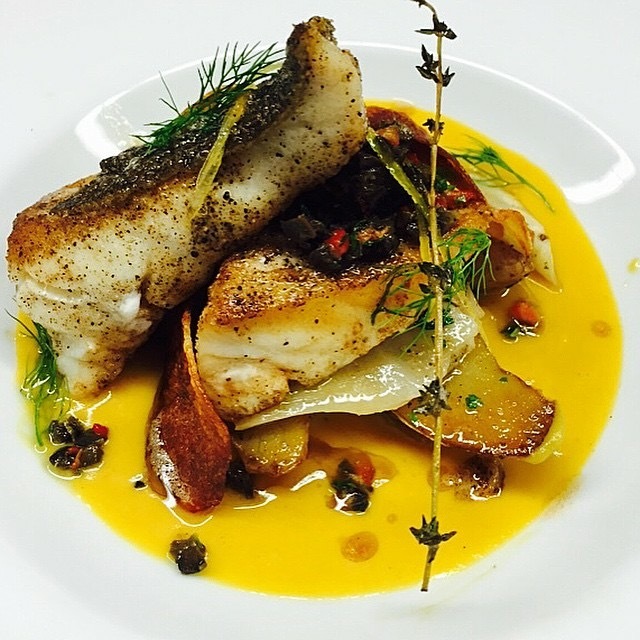 Enjoy it with Braised Fennel, Confit Potatoes and Tapenade. Place the first 4 ingredients in a food processor and pulse a few times until a chunky paste forms. Pour in the olive oil and pulse several more times. Transfer to a bowl, season to taste with salt and pepper. Place in the refrigerator until ready to use. Will keep for up to 2 weeks. In a large bowl, combine the potatoes, shallots, duck fat, and balsamic vinegar. Season with salt and pepper to taste. Spread the potato mixture onto a parchment paper-lined baking sheet. Bake on the middle rack of the oven for 1 hour or until potatoes are tender. Stir from time to time while baking. When ready to serve, sprinkle with parsley and thyme and plate as a side dish with the pickerel and braised fennel. Cut the tops off the fennel bulbs, chop 2 tablespoons of the fronds and set aside. Slice the fennel bulbs in half, lengthwise, through the core. Then slice each half lengthwise into quarters (you should get eight pieces total out of each fennel bulb), leaving some of the core attached so the pieces don’t fall apart as they cook. Melt the butter in a large sauté pan over medium-high heat and place the fennel pieces in the pan in a single layer. Reduce the heat to medium and cook the fennel pieces, without moving them, for at least 2 minutes. Sprinkle the salt and sugar over the fennel. Cook for another minute, turn the fennel pieces over and brown the other side. When both sides of the fennel are nicely browned, add the anise liqueur to the pan. Increase the heat to medium high. The liquor should boil down quickly. When the liqueur is almost gone, add the stock and water. Bring the liquid to a boil. Then reduce the heat down to low, cover the pan and simmer for 15 minutes. Remove the cover, increase the heat to high and let the stock cook down until it’s a glaze. Add the fennel fronds and most of the orange zest and combine gently. When ready to serve, garnish with the rest of the zest and a few splashes of lemon juice. Combine flour, paprika, salt and pepper in a bowl or container that will fit the pickerel. Preheat a frying pan on medium-high heat. Add the oil. Coat the fillets in the flour mixture and fry till golden brown on both sides, about 2 to 3 minutes on each side. Remove from pan and place on paper towel until they are all done. When all fillets are cooked, pour the wine and the lemon juice into the same pan to deglaze it. Allow the liquid to reduce a bit (about 3 or 4 minutes) and add the chopped herbs and then add the cold butter. melts and incorporates with the wine, lemon juice and herbs. Plate the fillets and pour some of the sauce onto each fillet. Serve the pickerel with the potatoes and braised fennel. Garnish each plate with the tapenade.